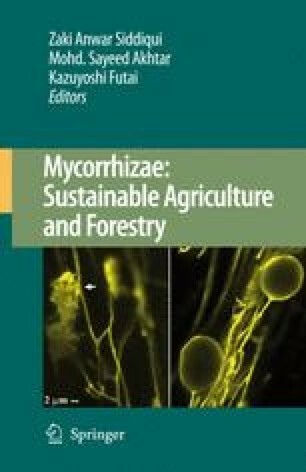 Mycorrhizal fungi play a crucial role in plant nutrient uptake, water relations, ecosystem establishment, plant diversity, and productivity of plants. Mycorrhizas also protect plants against root pathogens and toxic stresses. The fundamental importance of the mycorrhizal association in restoration and to improve revegetation of disturbed mined lands is well recognized. However, the use of mycorrhizal biotechnology in land reclamation and revegetation of disturbed mine sites is not well practiced in many parts of the world. The destruction of mycorrhizal fungal network in soil system is the vital event of soil disturbance, and its reinstallation is an essential approach of habitat restoration. Successful revegetation of severely disturbed mine lands can be achieved by using “biological tools” mycorrhizal fungi inoculated tree seedlings, shrubs, and grasses. This chapter discusses the different types of mycorrhizas, which play an essential function in altering disturbed lands into productive lands, the mechanisms by which disturbed ecosystem benefits through symbiotic associations and their interactions in the rhizosphere. The importance of reinstallation of mycorrhizal systems in the rhizosphere is emphasized and their impact in landscape regeneration and in bioremediation of contaminated soils are discussed.